La terre avant le deluge. Paris: Libraire de L. Hachette, 1863. 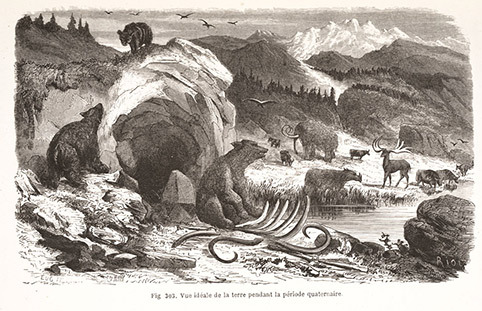 Louis Figuier would become one of the great popularizers of science in late nineteenth-century France, and one of his first efforts was this book on prehistoric life. 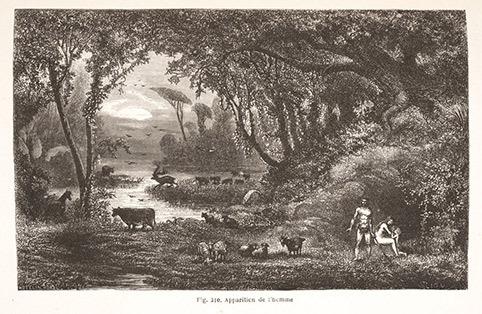 Here he was not concerned so much with human antiquity, as he was with the ages of giant ferns, rapacious dinosaurs, and extinct mammals, such as cave bears. 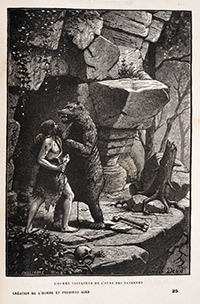 But he did include one illustration of early humans, which he called “L’apparition de l’homme.” It is of note that there are no extinct mammals in the human scene, and no humans in the depiction of the cave bears, at least not in this first edition of 1863. But soon, in subsequent editions of his popular book, Figuier would reveal a new “apparition of man,” as the next item demonstrates.